Viking Age Fences and Early Settlement Dynamics in Iceland Árni Einarsson* Abstract - Soon after the settlement of Iceland in the late 9th and early 10th century, an extensive system of turf walls was erected and was functional for about 200 years. After its collapse in the 12th century, few if any walls were built until the late 18th century. The remnants of this Viking Age fence system have been mapped in northeast Iceland, revealing enclosures with a characteristic geometry, broadly reflecting property boundaries. The fences are the product of a pastoral society, which then as now was based on dispersed farmsteads subsisting on animal husbandry. There was a strong seasonal component, most notably a need for harvesting and storing winter fodder. The short-lived fence system offers a rare snapshot of the division of a newly colonized landscape into functional units. This paper presents a framework for evaluating those units based on current thinking in behavioral ecology. The settlement of Iceland by the Viking Age colonists may be described by principles of habitat-selection theory, and the configuration of fences may be understood by factors governing division of spatial resources by territorial organisms. These factors include density, predictability and dispersion of resources, habitat geometry, intruder pressure, and economic defendability. Finer-scale fence patterns emerge from the interaction of territorial boundaries and a need to restrict livestock movements within the farmstead. Illustrative examples are drawn from the author’s own studies of settlement patterns and configuration of defended space in wild ducks and also from the medieval Book of Settlements, which describes the early colonization of Iceland. *Árni Einarsson, Myvatn Research Station, IS 660 Mývatn, Iceland, and University of Iceland, Faculty of Life and Environmental Sciences, Sturlugata 7, IS 101 Reykjavík, Iceland; arnie@hi.is. Introduction Land-ownership patterns, including the size, shape, and distribution of fields and other parcels of land, usually have deep historical roots (Grigg 1974, Roberts 1996). Until modern technology led to widespread consolidation of land, the agricultural landscape was fragmented into a complex pattern of units reflecting many factors such as: topography; ecological, economical, and cultural conditions including population density, ownership, inheritance, labor costs, type of utilization, transport routes, and security; as well as the changes of all these through time. In northern Europe for example, the pre-20thcentury agricultural mosaic had roots in medieval times, sometimes underlain by even more-ancient patterns (e.g., Fleming 1988). Where the ancient land-use patterns can be discerned, they provide a window to the past and are of considerable interest to anthropologists, archaeologists, and historians alike. In places where animal husbandry prevails, the land-use pattern supposedly differs from that seen in crop-producing landscapes. Animal husbandry usually needs a means to restrict livestock movements, by herding or fencing or both. An extensively fenced tract of land may be taken as a sign that animal husbandry plays a significant economic role in the region. Historically, a community that actively divided its land by fences, or abandoned such a system, was probably undergoing a major social and economic transformation (e.g., Thorpe 1951), possibly involving a shift in the relative importance of animal husbandry or an overall change in the economy of fencing, including factors like fence cost, soil fertility, or availability of labor. Two well-known cases of economic transformations involving fencing come from Britain and North America. In Britain, the process is generally known as “enclosure”, where dominant 16th–19thcentury landowners transformed the rural settlement by fencing off pieces of common land for sheep grazing. 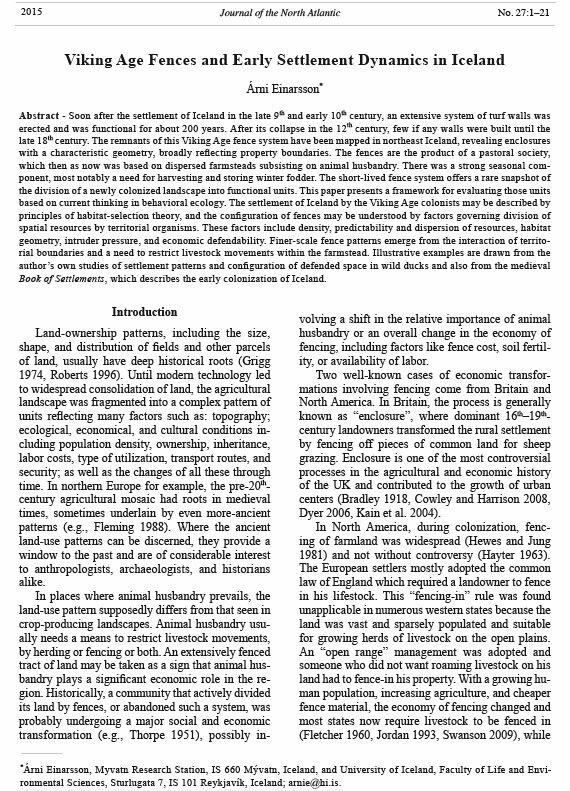 Enclosure is one of the most controversial processes in the agricultural and economic history of the UK and contributed to the growth of urban centers (Bradley 1918, Cowley and Harrison 2008, Dyer 2006, Kain et al. 2004). In North America, during colonization, fencing of farmland was widespread (Hewes and Jung 1981) and not without controversy (Hayter 1963). The European settlers mostly adopted the common law of England which required a landowner to fence in his lifestock. This “fencing-in” rule was found unapplicable in numerous western states because the land was vast and sparsely populated and suitable for growing herds of livestock on the open plains. An “open range” management was adopted and someone who did not want roaming livestock on his land had to fence-in his property. With a growing human population, increasing agriculture, and cheaper fence material, the economy of fencing changed and most states now require livestock to be fenced in (Fletcher 1960, Jordan 1993, Swanson 2009), while 2015 Journal of the North Atlantic No. 27:1–21 2015 Journal of the North Atlantic No. 27 Á. Einarsson 2 open-range management still exists in certain areas of most western states (Andes 2000). As in Britain, this develoment was not peaceful. In late-19th-century Texas, a series of disputes, the “Fence-Cutting War” broke out when established cattle breeders began to fence off their larger tracts of land with barbed wire in order to protect them from farmers’ claims. The farmers saw this as a closing of the open range, and began to cut fences in order to reclaim lands in the public domain (Gard 1947). In the early 10th century, an extensive system of turf walls was built in northeast Iceland (Einarsson et al. 2002, unpubl data). The walls were in use over a relatively short period (10th–12th century), but their remains have been traced archaeologically to reveal a complex network of enclosures extending from the coast to the lower highlands (Fig. 1; Einarsson and Aldred 2011, Einarsson et al. 2002). In Iceland, human settlement started relatively late. Literary tradition, supported by archaeological, palaeoecological, linguistic, and genetic evidence, indicates that colonization of the hitherto virgin island took place by a wave of immigration in the period A.D. 870–930, principally from Norway but also from Viking colonies in the northern part of the British Isles (e.g., Hallsdóttir and Caseldine 2005, Helgason et al. 2000, Krzewińska et al. 2015, Smith 1995, Vésteinsson and McGovern 2012). The settlers cleared the birch scrubland and established a dispersed farming society subsisting to a large degree on animal husbandry. Each farming unit consisted of one or more households with a group of workers and slaves (Vésteinsson 1998). This period of settlement set the stage for social development that was to influence the future course of events in Iceland. A short-lived network of fences, like the Viking one associated with the settlement in Iceland, offers a rare glimpse of land partitioning in a society in its infancy and probably little obscured by previous land use and later developments. The large-scale abandonment of the fences may also signify a major social transformation. But what do the fencing walls tell us? The situations leading to the construction and abandonment of this fence system are still unknown, but the geometry of the fence patterns must contain information that we may use to make inferences about the Viking Age farming system and its resources. This information cannot be extracted without some theoretical framework. We need to know which environmental, economic, and behavioral variables are most important and what kind of dynamics shape the fence pattern. The fences can be viewed on 3 different scales. The largest scale is the overall distribution of habitable land. Another scale is the division of the habitable land among the farmsteads, and the third and smallest scale is the division of individual farmsteads into units of management. The division of habitable land among farmsteads, such as that occurring in historical times in Iceland, can be characterized as a territorial system (Bolender et al. 2008, Cashdan 1983, Dyson-Hudson and Smith 1978, Maurer 1852) with well-defined property boundaries. Such systems have been most thoroughly described in the field of behavioral ecology and occur where the cost of defending the resources is less than that of sharing or foraging elsewhere. The boundaries in territorial systems are dynamically shaped by variables such as intrusion pressure, resource density, and predictability (Maher and Lott 2000). The ancient wall system must partly reflect such territory boundaries, but there should also be intra-farmstead fences reflecting the need to confine and separate groups of livestock and to respond to seasonal changes in resources. The aim of this paper is to illustrate the basic factors shaping the layout of fenced areas, in order to aid the interpretation of spatial patterns of archaeological boundaries in general and the Icelandic Viking Age walls in particular. The paper reviews theoretical work on how settlement and boundary patterns are generated by competition for space. Ecologists have developed a suite of models to explore how land is divided among settlers, all of them revealing the dynamic nature of land division. The results from a field study of space division in the real world (by a territorial duck) will be presented in my discussions here. In another section, I will assess how realistically the medieval Book of Settlements describes the Viking Age settling process of Iceland. In two final sections, I examine how the geometry of fenced areas should depend on competitive interaction, landscape dimensionality, slope, fence costs, and the needs of local stock and crop management. Finally, I speculate on the rise and fall of the Viking Age fence system. The Viking Age Fences The landscape The Viking Age walls have been studied in a 3000-km2 area in the counties of Suður- and Norður Þingeyjarsýsla in northeastern Iceland (Fig. 1). The area can conveniently be divided into 4 main geographical units (Einarsson and Aldred 2011). Two of them (Kelduhverfi and Mývatn area) are characterized by a flat landscape with extensive postglacial (postdating the end of the Ice Age) lava fields, interrupted by ridges of hyaloclastite (consolidated, Journal of the North Atlantic 3 2015 No. 27 Á. Einarsson sandstone-like tephra from glacial periods). A third landscape unit are the glacier-carved valleys between Lake Mývatn and the coast. This area is outside the zone of present-day volcanic activity, although big prehistoric lava streams cover the bottom of 2 of the valleys. The bedrock here is moraine-covered basalt with a rather thin layer of organic soil. The shallow valleys provide the focus for most of the present-day farming. They are separated by oval ridges of moorland that extend from the highland plateau of Iceland towards the coast. The fourth landscape unit is the west coast of the Tjörnes peninsula. This area has a Figure 1. A map of the study area in northeastern Iceland showing the extent of the medieval wall system (red). Green colors indicate vegetated land. 2015 Journal of the North Atlantic No. 27 Á. Einarsson 4 low rocky coastline with small streams at regular intervals and basaltic bedrock covered by thick banks of raised marine sediments. The whole habitable area of northeast Iceland was apparently covered with birch (Betula pubescens) scrubland at the time of first settlement (Lawson et al. 2007). Today it is largely devoid of woodland. The vegetation on the moorland and lava areas, and in some of the uninhabited parts of the valleys, is mostly heath-like, dominated by dwarf birch (B. nana) and crowberry (Empetrum nigrum). The inhabited parts of the study area have much more grassland. Hay for winter fodder is the only substantial crop produced on the hayfields around the farms. Bogs and other wetlands are scattered throughout the area except in the largest lava fields. Extensive blanket and string bogs are characteristic of the southernmost moorlands. The soil cover is mostly continuous but is locally eroded in many exposed and steep places. The study area has been inhabited from the very beginning of settlement (McGovern et al. 2007) and, like elsewhere in Iceland, was based on dispersed farms with a livestock of cattle, sheep, horses, pigs, and goats feeding on grass from hayfields, meadows, and pastures and also browsing of birch leaves and twigs in the woodlands. The inhabitants also used wildlife resources such as salmonid fish in the lakes and rivers, abundant sea fish and sea birds (including eggs), and rock ptarmigan (Lagopus muta). Some of the coastal wildlife harvest was brought inland for processing or consumption (McGovern et al. 2006). The walls The ancient turf walls are the most prominent feature of the archaeological landscape of northeast Iceland (Fig. 2). They run long distances (over 600 km have been mapped to date), criss-crossing the moorlands and heaths (Aldred 2008, Einarsson et al. 2002). The walls have collapsed, and most now can only be seen as low earthworks in the landscape. They seem roughly contemporaneous though there are indications of multiple phases of construction in some areas. For the most part, a basic pattern can be discerned, modified by only minor repairs, rebuilds, and additions, and it appears that the walls went out of use a few generations after they were built. Tephrochronological dating places the majority Figure 2. Viking age turf walls in the study area. (a) Oblique aerial view of a complex of wall and farm ruins. (b) A cross section of a wall, the stacked turf is revealed by a repeated sequence of dark volcanic tephra layers. (c) and (d) Remains of two walls on the ground. Photographs © Árni Einarsson. Journal of the North Atlantic 5 2015 No. 27 Á. Einarsson in the 10th–11th centuries. Their maintenance was discontinued sometime before the 13th century, and almost all the dated walls had collapsed long before a characteristic tephra layer from A.D. 1477 was deposited (e.g., Hreidarsdóttir and Ólafsson 2012, unpubl. data). The walls form a basic pattern of enclosures (Fig. 3), each one corresponding to an individual farm but also internally subdivided, evidently for more-local management of grazing, stock manipulation, and protection of growing crops (mostly grass). In the valley and coastal landscapes, the enclosures tend to be square-shaped. Walls run uphill on what seems likely to be property boundaries between farms. A horizontal wall (a head wall) on the hillside divides the rangeland above the farm into a near and far section. These walls, enclosing the farm on 3 sides (a river or seashore typically closes the boundary on the downhill side), often look like they have been built as a single entity. The head-wall usually joins similar ones on the neighboring farms, creating a continuous structure that integrates multiple farm properties and fences entire valleys from the surrounding hills (Einarsson and Aldred 2011). In flat landscape, such as some heathlands at the southern border of the study area and in the lava fields, round enclosures tend to be more prominent than square ones, which are more typical for the valley and coastal habitats. Behavioral Ecology of Territoriality and Settlement Patterns The Viking Age walls are fences for livestock management. Many of them are likely to trace property boundaries, and most of those were probably established by behavioral interactions during the settlement period where competition for space must have been a major factor. If we want to understand this process and its outcome, it is necessary to look Figure 3. A part of the turf wall system in northeastern Iceland. 2015 Journal of the North Atlantic No. 27 Á. Einarsson 6 at factors determining the shape and configuration of territorial boundaries in general.This section gives a brief overview of current ideas in ecology regarding how space is divided and settlement patterns emerge in mobile organisms. The emphasis is on organisms competing for space, leading to the formation of territories, defined as any defended spaces with a fixed location (see Adams 2001). The basic idea is that territory boundaries, created by excluding others from local resources that are in demand, will be molded by opposing pressures of intrusion and repulsion. The focus here will be on territorial behavior of individuals or families, not larger groups such as tribes or larger social units. Division of land through territorial behavior is frequently observed in the animal world, giving rise to interesting spatial patterns resulting from the repulsive behavior. Ecologists have developed models to describe how space is divided and how it is influenced by resource density, resource dispersion and predictability, intrusion pressure, and cost of defense (e.g., Adams 2001). These models have been useful for interpreting territoriality and sociality in such diverse groups as fish, birds, reptiles, and mammals. They have shed light on differences in space use when a species occupies habitats of different quality, and have also been used to analyze the dynamic situation that arises when migratory birds settle in their breeding habitat in spring. The models are not species-specific and have a high degree of generality which makes them useful also for insight into settlement patterns and land tenure in human societies (Baker 2003, Cashdan 1983, Chabot-Hanowell and Smith 2013, Dyson-Hudson and Smith 1978, Field 2005, VanValkenburgh and Osborne 2013). I will give a short review of such models here because they shed light on the dynamics of the situation. It should be emphasized that animal behavior is not used here as an analogy for human behavior. Rather I make use of models that describe how antagonistic behavior of mobile organisms creates and shapes settlement patterns. It just happens that most of the models have been developed by animal ecologists. In this section, numerous references are made to “patches” and “habitats”. Patches refer to a division of land roughly corresponding to the home range of an individual. In human settlement terms, a patch would mean an inhabitable spot. Habitat refers to a larger area; here it is used as a set of patches of similar type or quality. On a human scale, lowland and upland areas would be 2 different habitats, so would south-facing vs. north-facing slopes, grasslands vs. woodlands, and landlocked vs. shore-based areas to name a few examples. Usually habitats can be contrasted, one being more suitable than the other. However, as we will see, the quality of habitat is not a fixed value but depends on the density of competitors. Farm property boundaries, defined by fences or formal agreement, and boundaries in a system of contagious non-overlapping animal territories (often defined by visual threat displays) will be discussed as “territory boundaries”. In most animal models, the agent responsible for territory defense is a male or a pair, but sometimes a family or a more complex kin group is involved. In the case of Viking Age farmers in the settlement period, the entire household was probably engaged in boundary patrol and maintenance, aided by pressure exerted by grazing livestock (and later by social contracts, such as law). Settlement patterns The earliest model of animal settlement was presented by Brown (1964) and is still useful in its simplicity (see also Brown 1969). When animals settle into a habitat on a seasonal basis, their settling patterns are expected to reflect their preference for rich food supplies. The first settlers ought to settle in the best feeding patches (given that nest sites are available). The best habitat will be filled up and become saturated. Further settlement will then take place in the second best habitat (e.g., Kluijver and Tinbergen 1953). When this habitat becomes saturated, further settlement may have to take place in a habitat which is unsuitable for breeding, resulting in “floaters” which postpone breeding or wait for an opportunity to fill a vacancy when an animal in a better habitat dies. The progress of settlement described by Brown’s model has been observed in a large number of animal populations. The model seems to describe both the seasonal settlement of migratory birds and also the situation when an animal population is expanding. As the population gets larger, more habitats are used (e.g., Newton 1998). This phenomenon is called the buffer effect. Brown’s model, although developed for birds, makes intuitive sense also in the human context: infilling of gradually less-productive and more-marginal habitats as colonization progresses, then a creation of a class of landless people with delayed marriage and household formation, some acting as subordinate individuals within the household or vagabonding. The next stepping stone of settlement theory was a paper published by two mathematicians, Fretwell and Lucas (1969). They realized that habitat saturation was not a fixed dimension but a dynamic process involving the number of contenders and the relative quality of the habitats. As a null model, they presented the ideal free distribution Journal of the North Atlantic 7 2015 No. 27 Á. Einarsson (IFD), a model which is still at the core of discussion. The name stems from the assumption they made of birds that are ideal in the sense of maximizing their fitness, having perfect knowledge of the environment and freedom to move from one place to another. According to the ideal free model, just as that of Brown (1964), the first birds to arrive in an area will settle in the most suitable habitat. With more birds settling, the suitability of the habitat is reduced because of competition with those already there. At some point, newcomers may find it advantageous to settle in habitats with less food and a lower density of competitors (Fretwell 1972, Lack 1966, Sutherland 1996). From this moment, both habitats will be settled in simultaneously, but at different densities. The difference between the predictions of the two models is that the “ideal free” model predicts simultaneous settlement of the two habitats after a certain density has been reached, whereas Brown’s model assumes that the better habitat becomes saturated before the inferior habitat begins to be colonized. Both models predict that settlement will begin later in the inferior habitat. Field studies have not quite been able to differentiate between the models, mostly because the models are based on oversimplifications. Habitats are not all that discrete, some degree of overlap in intrinsic quality can be expected, and there is a fair degree of unpredictability in the environment. Some birds that settle in an inferior habitat may be successful and will tend to go for the same place the following breeding season (site tenacity) and the offspring tend to do the same (philopatry, silver-spoon effect). Despite these shortcomings (e.g., Hugie and Grand 1998, Tregenza and Thompson 1998), the models make a useful framework for thinking about settlement processes, and the IFD model has been employed to analyze archaeological records of the prehistoric establishment and expansion of human settlements on the Northern Channel Islands of southern California (Winterhalder et al. 2010; see also Kennett et al. 2006 for settlements in Oceania). One assumption of the “ideal free” model that definately does not hold is that birds are free to move. In the actual world, a dominance hierarchy (peck order) will restrict their movements, especially the site-specific dominance called territoriality. In many bird species, for example, territories are exclusive, and the movements of new birds are more or less restricted to areas not taken by earlier settlers. In these cases, the first settlers occupy the best patches. The ensuing process then is what Fretwell and Lucas (1969) called the ideal despotic distribution. The ideal despotic model assumes that an individual that has settled in a habitat defends the patch that it has settled in and monopolizes it. The first one to arrive will select the best patch, and the subsequent settlers will be forced to settle in progressively less suitable patches. These later settlers might compensate by keeping larger territories, but the density of resources is lower and more effort is needed to utilize them. Eventually, the only suitable patches available in the richer habitat are similar to, or poorer than the best patches in the poorer habitat. The overall settlement pattern will be similar in both the free and despotic models. Nicholson, one of the eminent figures of ecological theory, termed these two modes of resource utilization “scramble” and “contest” competition respectively (Nicholson 1958). In scramble competition the game is to eat faster than the others, in contest competition others are kept away from the resources, which only works if the benefits of such behavior outweight the costs. Saturated habitats, polygamy, and natal dispersal Behavioral ecology has produced theories about what happens when habitats become saturated. When habitats get crowded, individuals may opt for settling inside already occupied territories in a good area rather than moving to a poor habitat with little reproductive potential. This theory would explain the frequently observed behavior when animals help others to raise their offspring (Brown 1987). The parent gains from the helping, the helper gains from experience and from being able to stay inside the habitat while waiting for a vacancy (a “pay to stay” strategy; Kokko et al. 2002). When habitats approach saturation, young animals tend to stay home longer, which often leads to “territory budding” where the youngster eventually wins a part of the parent territory and a slice of the neighboring one for himself (Komdeur and Edelaar 2001). Orians (1969) developed a similar idea, the polygyny threshold model, to predict when certain bird species switched from monogamy to polygamy. In this model, males claim territories, which differ in quality, and then start to attract mates. An unpaired female may choose between being the only mate in an inferior territory or to become the second mate in a good territory. This tactic may be advantageous in spite of a higher number of inhabitants on the good territory and having to share a mate with another female. In human terms, as habitats get saturated, the frequency of co-residence should increase. The results include cheap labor, tenancy, and joint and extended families (see Benedictow 1993). Generally speaking, when habitats are filled, theory predicts more sociality. 2015 Journal of the North Atlantic No. 27 Á. Einarsson 8 early settlers would tend to keep a large distance from each other, but still short enough to prevent a new territory to squeeze in between. The result of sequential colonization should be that (1) territories would tend to be larger than minimum, and (2) the earliest territories would tend to be clustered together. Evidence of such attraction was reviewed and tested experimentally by Stamps (1988). The model was further developed by Getty (1981), Stamps (1988), and Stamps and Krishnan (1990). Territory shape Territory shapes tend towards certain geometric configurations that reflect the 2 opposing forces of intruder density and repulsion by the owner. An ideal territory would be circular, but pressure from neighbors will generate a near-hexagonal shape and will tend to equalize territory sizes within a habitat (Fig. 4; e.g., Barlow 1974, Hasegawa and Tanemura 1976). It should be noted that utilization of spacedout resources by non-territorial organisms dispersed from their homes also leads to near-hexagonal patterns of activity (cf. central place foraging in ecology [Orians and Pearson 1979] and catchment analysis in archaeology [Vita Finzi and Higgs 1970]). Not all habitats are spacious enough to allow a near-hexagonal pattern to develop. Many habitats are linear, e.g., river banks, forest edges, narrow valleys, and seashores, and computer simulations and even tests with interacting robots have shown that territories in such habitats tend to become square-shaped (Fig. 5; Votel et al. 2000). The ducks discussed below show exactly this feature (see also Currie et al. 2000 for another example). A case study: Wild duck territories This section gives a brief overview of a case study by Einarsson (1990) of a territorial animal where the filling-in of different habitats at the beginning of the breeding season was followed in detail. The study was on the Barrow’s goldeneye duck (Bucephala islandica; Fig. 6) and offers a useful illustration of the organizing forces that shape settlement patterns. In spring, duck pairs established territories on open water (Fig. 7). The territories were easily mapped by observing the behavior of the tame birds. The males defended square-shaped territories on the water along the shore of the lake and also on the effluent river. The territory boundaries, which appeared to follow invisible lines on the water surface, were well defined and maintained by direct-threat displays and attacks. Defended areas were restricted to the water surface and did not include the nest sites, which were in the surrounding landscape. The pair spent over 90% of its activity within the territory, only leaving Territory size in relation to habitat richness So far we have described rather simple theories about the sequential filling of habitats without worrying too much about the behavioral mechanisms. Such mechanisms may be important if they result in a thinning out of the population. If a habitat contains a certain density of individuals and territorial behavior simply works to space them out, the territory owner gains access to the habitat and lower travel costs while foraging. In this case, the territorial behavior alone has no effect on the population dynamics. If, however, the repulsive effect of territorial behavior leads to a lower density than might occur otherwise, then more individuals will be forced into inferior habitats with lower reproductive potential, leading to a stronger density-dependent effect that will affect final population size. Which of the scenarios is more common is an issue that has not been resolved and will not be discussed here. There are, however, observations on territorial behavior and territory size that deserve attention in the human context of this paper. The first, and a very common observation is a negative correlation between resource density and territory size (among the earliest ones being reported by Cody and Cody 1972, Gill and Wolf 1975, Kodric-Brown and Brown 1978, Simon 1975). Rich habitats have small territories, poor habitats tend to have large territories, but the variation in territory size is usually high. It might seem obvious that animals will not defend larger territories than needed and that in a poor habitat a larger area is needed for subsistence. Theoretical and experimental work with animals, however, has shown that this is an oversimplification, and several authors have developed models that emphasize that territory size is a payoff between the gain of keeping a large territory and the costs incurred by defending a larger area. The territory size should be adjusted so that the gain is maximized or at least not outweighed by the cost (Hixon 1980, Lima 1984, Schoener 1983). This model implies that territory sizes vary according to both resource levels and intrusion pressure (e.g., Eberhard and Ewald 1994). Intrusion pressure increases with relative resource level, i.e., attractiveness of the land, and population size. In the context of the present paper, intrusion pressure is not only exerted by fellow humans but also by their grazing animals. There are other factors to consider. John Maynard Smith (1974) presented a model to illustrate the possible consequences of sequential versus simultaneous establishment of territories. Animals arriving simultaneously would tend to squeeze into the available habitat, compressing the territories to a minimum size. In sequential colonization, the Journal of the North Atlantic 9 2015 No. 27 Á. Einarsson divisions between contrasting subhabitats can be made: (1) between the lake and the river, the latter being far more productive; (2) between the upper and lower parts of the river, the former being more productive; and (3) between inshore and offshore parts of the lake, with similar resources in both parts but with lower defensibility offshore due to more for visiting nest-sites and if insects emerging from the lake offered a temporally superabundant food source. The ducks fed on small invertebrate animals on the lake and river bottom. The duck habitat can be divided into subhabitats with different resource density (food abundance) that allow comparison of settlement patterns. Three Figure 4. A regular settlement pattern is automatically generated if imagined settlers avoid each other. Left: Voronoi polygons drawn around randomly distributed points (settlers). Right: A spaced out equilibrium situation after the settlers have been allowed repeatedly to move to the centroids of the polygons. A system of near-hexagonal territories has been formed. Redrawn from Hasegawa and Tanemura (1976). Figure 5. The effect of changing the dimensionality of a habitat on the shape of territories. Linear and two-dimensional habitats tend to have square and polygonal territories respectively. The rules of behavior of the “settlers” is the same as in Figure 4. The diagrams show equilibrium configurations for 3 “settlers” (dots). Stable equilibria to the left, unstable equilibria to the right. h = height, w = width of the rectangle. Redrawn from Votel et al. (2000). Figure 6. A male Barrow’s goldeneye. Photograph © Yann Kolbeinsson. 2015 Journal of the North Atlantic No. 27 Á. Einarsson 10 spring before poorer subhabitats were saturated, so that the number of territorial pairs in the richer subhabitat rose to a peak and then decreased again while the numbers were still rising in the poorer subhabitat. Many territories in the poorer subhabitat were eventually abandoned, but it is not known if they moved to a still poorer habitat farther away or skipped breeding. The inshore/offshore subhabitat division was also illustrative (Fig. 7). Despite a similar resource density, the inshore area was colonized first and the offshore habitat was colonized only after the inshore exposed boundaries (Einarsson 1990). The study showed that the richer subhabitat (river) was colonized faster and reached higher bird densities (and consequently smaller territories) than the poorer one (lake). Neighbor distances ranged between 20 and 150 m (mode around 50 m) in the rich habitat, but were between 20 and 320 m (mode around 90 m) in the poorer habitat (Fig. 8). A buffer effect was observed, in that the richer habitat became saturated, and further settlement took place only in the inferior habitat (Fig. 8.). The richer subhabitats became temporarily overcrowded in the Figure 7. Barrow’s goldeneye territories in a small bay at Lake Mývatn on three successive dates. (A) Increasing density, most territories along the shoreline. First offshore territories beginning to form. A flock of non-territorial birds in the outer bay; (B) Maximum density and oversaturation, a number of offshore territories present; (C) Final density. The flock of nonterritorial birds has disappeared. Each dot indicates a resident duck pair. Modified from Einarsson (1990). Figure 8. (A) The buffer effect displayed by territorial Barrow’s goldeneye ducks on the river Laxá at Mývatn in Iceland. The river has been divided into an upper (richer) and a lower (poorer) part. The ducks settle first on the richer part, then both parts are colonized at a similar rate until the rich part has become saturated. After that, all further increase is confined to the poorer part. (B) Pairs on small territories need to spend more time feeding than pairs on larger territories in the same bay, despite similar food resource densities. This fact probably reflects the more stressful situation in territories that have more of their boundaries exposed to intrusion (C). Modified from Einarsson (1990). (D) Frequency distributions of distances between territorial neighbors in two adjoining habitats where one habitat is 10–20 times richer than the other. From Einarsson (1985). Journal of the North Atlantic 11 2015 No. 27 Á. Einarsson of Iceland, Grágás, which has extensive regulations on how to build walls on property boundaries (Dennis et al. 2000, Karlsson et al. 1992). The law presented in the book were contemporaneous with the walls and defined what constituted a lawful property boundary wall, as well as how, when, and by whom it should be constructed (Table 1). The other documentary source is the Book of Settlements (BoS, Icel. Landnámabók; Benediktsson 1968, Pálsson and Edwards 2007), a unique piece of medieval literature, and the one on which we shall focus here. It is a register of the main characters who allegedly moved to Iceland in the “Settlement Period”, A.D. 870–930. The compilation was carried out some 200–300 years later, which limits the accuracy of its information (Friðriksson and Vésteinsson 2003, Rafnsson 1974), and furthermore, some of the text is augmented by material of a mythological character. Despite this, its information has not yet been contradicted by current archaeological knowledge, and the book was a product of a society with a rich oral tradition, with much awareness of geography and history and where tracing of genealogy played a major part (Pálsson and Edwards 2007). The BoS gives a picture of the early settlement process. It says who settled where, often with some details of the circumstances, including territory boundaries. There is a pattern in the settlement process according to BoS that suggests that the course of events may be described in similar terms as those behind current ideas of habitat selection and territoriality. In the animal world, territories are aquired by various means. A newcomer may settle in an unoccupied patch or he may fight for a patch in an occupied area, displacing an earlier settler. In areas had reached maximum density. The offshore territories were smaller (the density was higher) because intruders could enter from all sides resulting in higher cost of defense (see Stamps et al. 1987 for theoretical aspects). Also, more of the intruders were strangers, leading to more elaborate and costly displays. The result for the holders of offshore territories was that they needed more time to feed and had less time for resting. All offshore territories were eventually abandoned and so were some of the inshore territories. The study suggests that the birds have a limited amount of time they can spend in defense and they will compensate for high defense costs by keeping a smaller territory. This strategy will compromise their feeding efficiency and may in the long run force them to abort the settling attempt. Inshore birds tried to minimize the exposed boundary of their territories and reduced intrusion by placing the territories against concave shorelines (small bays). The overall result of this balance between defense costs and intrusion pressure in the Barrow’s goldeneye is that richer habitats have a higher population density than poorer areas. The Book of Settlements The Viking Age walls reflect a settlement pattern and territorial boundaries that had stabilized after a colonization process, presumably with much social interaction where the ever increasing number of competitors and their drive to settle in the favored habitat must have been important features. Two ancient documentary sources provide insight into this process. One of them is the oldest medieval lawbook Table 1. Legal walls (standardized property boundary walls) in Iceland according to the Grágás lawcode (Dennis et al. 2000:109–111, 115–116, 138–139, 301, 303; Karlsson et al. 1992:31 1–314, 321–322, 342–343). Feature Regulation according to the Grágás law code Time of year and effort A call for wall building means that the landowner and his neighbor have to spend two months per year in the following three years in construction. During the two months (May and June) the construction work should be given priority over other work except driving livestock home and collecting firewood. A third month (September) was allocated for private wall work. Dimensions Five feet thick at ground level, three feet at top. Shoulder height of an average person (about 1.50 m, but a trench, created by digging the building material on one or both sides, adds to the effective height). Material Material should be available so close that it needs not be transported by animals or cart. Workers The farmer should not need to spend more labor than is normally available at his household. Gates When a wall crosses a public way there should be a hinged gate, a fathom and an ell wide, so that if a man wishes he may open and close it from horseback. Cost Half and half with neighbor. If the adjacent land is owned by many (communal pasture), half of the cost will be divided among them. Legal aspects A farmer can only sue his neighbor for grazing on his land if there is a legal wall in place. Shortcuts Shortcuts are encouraged across bends in the boundaries. The wall shall run as straight as possible through meadowland. Walls should run around very valuable land such as nesting colonies, hayfields, and woodland. 2015 Journal of the North Atlantic No. 27 Á. Einarsson 12 The BoS mentions about 430 settlers over the period of 60 years and gives useful information on 384 of them (Table 2). In the majority, or 267 cases, the BoS simply states that they settled in (Icelandic nam, 265 cases) or claimed (Icel. eignaði sér, 2 cases) a certain area, and more often than not the territory boundaries are specified. In 30 more cases, the settler was said to have made his or her home or established a farm in a place (Icel. byggði, bjó, gerði bú, átti) without defining the piece of land or how it was aquired. In 19 more cases, a place was settled at someone’s advice, and in one case by someone’s permission. In 44 cases, the territory was received as a gift from an earlier settler, in 18 (41%) of those cases it was from a close relative. A total of 17 territories were said to have been bought, only one of them from a close relative and only because she insisted on paying for the piece of land. When a territory was bought or received as a gift, it was carved out of a larger territory. In one case, the entire territory was sold and the former owner left. There were 23 records of hostile takeover (duels, threats, or forced selling). Another 4 movements were associated with matrimonial issues. Twenty-two settlers spent one or more winters with earlier established relatives before settling in a place. Two people were said to have moved their settlement in search for better land. For 147 settlers, a territory boundary was said to have been formed by a river, and 9 of those were also said to have a boundary formed by a mountain, lake, or a glacier. Most if not all the named settlers claimed more land than could be utilized by a single farmstead. Some of the early settlers claimed large tracts of land, sometimes a whole fjord with adjacent valleys, that were later subdivided, and according to BoS this behavior created a stir among later settlers and the matter was resolved by the Norwegian king, who proposed rules to constrain maximum territory size (Benediktsson 1968:337). either case, he may eventually have to fend off later settlers. In the human context, purchase of land can be seen as a peaceful way to settle a potential territorial dispute. Final boundaries will be set by mutual respect of the territorial neighbors, who will avoid direct confrontations. Ecological theory also expects animals to move between habitats while searching for the best one. In summary, an ecologist would expect to see in BoS some evidence of exploration, habitat selection, competition, aggression, boundary conflicts, and displacement. To a certain degree, the best habitat should be colonized first and then sequential filling of habitats by productivity is expected, taking into account that suitability of a habitat changes with the number of settlers already there. Early territories should be large and then contract as population size and intrusion pressure rises, a process that has been reported not only in ducks (Fig. 7) but also a number of other species (e.g., Kendeigh 1941, Blank and Ash 1956, Ickes and Ficken 1970, Zimmerman 1971). Territories in regionally poorer habitat should be larger than those in rich habitats, mainly because of low intrusion pressure. Territory owners may move due to improved knowledge of resources, pairing, or because they were displaced. Conflicts should occur and may increase in the next generation as the population grows and as the natural environment changes in response to exploitation. A final adjustment is expected as settlers become more familiar with the landscape, some may expand their territories while others abandon theirs. Boundaries are expected to follow natural landmarks, such as rivers, that enhance the defensibility of the territories (Eason et al. 1999, Reid and Weatherhead 1988). The BoS does not yield information on all those factors, and contains little information that allows an evaluation of the sequential filling of habitat by productivity. There are indications though that the writers expected such a relationship. One comment is that some of the earliest colonizers settled near the mountains, having noticed that livestock was attracted to the good grazing in the mountains. This observation is followed by a comment in one of the manuscripts that also in Norway the early human settlement had followed the productivity of the land (Benediktsson 1968:337). Another comment illustrates the significance of travel costs: the south coast was the last piece of land to be fully settled because of paucity of landing sites (Benediktsson 1968:337). And shortly later, in a different manuscript, it is stated that the south of Iceland is the most productive part of the island (Benediktsson 1968:338). Table 2. Circumstances of aquiring a territory in the medieval Book of Settlements. The figures refer to the number of cases mentioned in the book. Circumstance Number of cases Direct settling (circumstances not given) 297 Settling by advice 19 Settling by permission 1 A gift (41% from relatives) 44 Buying (6% from relatives) 17 Movement by matrimonial issue 4 Moving to better location 5 Forced displacement: Killed 4 Threatened 12 Bought away 4 Carved a piece out of another’s land 3 Journal of the North Atlantic 13 2015 No. 27 Á. Einarsson One characteristic of the settlement process is the indication that the earlier settlers were controlling the later settlements through social interactions (selling, giving away, granting permission, giving advice) and there was a strong nepotic element. While the social mediation may have strengthened long-term social bonds and hierarchies, there is nothing to suggest that the resulting settlement pattern would have been different without it (for an alternative view see Vésteinsson 1998, 2006; Vésteinsson et al. 2002). The large territories were indefendable anyway, and giving away or selling a piece of it can be seen as a means to manage the retreat and avoid aggressive encounters. Archaeological evidence, supported by written sources (The Book of Icelanders Íslendingabók and BoS), indicates that the colonization of Iceland was a rapid process (Benediktsson 1968:5, Vésteinsson and McGovern 2012). One study in particular, in Skagafjörður in central North Iceland, has focused on the relative timing within a group of adjacent territories (Bolender 2008, Bolender et al. 2008). The first farmsteads were established in the Settlement Period (A.D. 870–930). By the second half of the 10th century, productive lands were under the control of specific households as lawfully recognized farmstead properties (Bolender et al. 2008:221). After that, new farmsteads were established by dividing an existing farmstead property. A final stage was reached at the end of the 11th century when cottage farms (Icel. hjáleiga) were established within the previous properties (Bolender et al. 2008). The progressive stages of farmstead establishment are perhaps most simply explained by population growth (immigration having ceased in the late 10th century according to the sagas mentioned above), but it is also possible that the last stage, the cottagers, had their origin in the large-scale abandonment in the 11th–12th centuries of marginal farmsteads, which were probably experiencing intensive habitat degradation (see later). The emergence of cottage farmers may be viewed with behavioral ideas similar to those behind the polygyny threshold model of Orians (1969); people may fare better by establishing a household inside someone elses territory and pay for it in the form of rent or labor service, than by occupying a territory of their own in marginal areas. A Theoretical Outline of Fencing What do ancient fences tell us? The fact that they were made indicates that animal husbandry was a significant part of the livelihood, the community could afford the investment, and the long-term benefit was believed to exceed the cost. But a wealth of additional information is contained in the geometry of the fence network that could be extracted if there was a theoretical outline for how fences fit into the rural landscape and how fenced boundaries are shaped by landscape characteristics, population density, and land use. To the degree that fences coincide with territory boundaries the animal-dispersion models will be useful. But some fences are for internal management only and are not expected to follow such boundaries. Before proceeding with a fence theory, some terminology needs to be clarified. Most farmland fences are for restraining livestock movements, yet the motives differ. They may be: (1) to protect growing crops such as hayfields; (2) for zonation by distance from farmhouse, e.g., to keep certain animals within reach; (3) to prevent mutual trespassing across territorial boundaries; (4) to seperate the sexes; (5) to separate milking animals and their offspring; (6) for zonation by land quality, e.g., to keep non-breeding animals away from the best pastures; (7) to allow rotation of pastures through the summer (cattle; cf., Halldórsson 1780:102); and (8) to create structures for herding (pens or corridors). Old Icelandic texts, medieval and later, mention various types of fencing walls, e.g., “pasture walls” (hagagarður), “meadow walls” (engjagarður), “hayfield walls” (túngarður, vallargirðing), “herding walls” (vörslugarður), “hay-storage walls” (heygarður), “property boundary walls” (landamerkjagarður, merkjagarður), and “small infield enclosures” (geilagarður). This terminology has limited use because purposes may overlap so that a particular fence may serve more than one function. Two adjacent patches of different resources may be divided by a single wall and its functional name will depend on which resource is the focus of discussion. As an example, a wall separating a pasture and a hayfield is a “hayfield wall” when seen from the hayfield perspective and a “pasture wall” when seen from the other side. Its primary function is to protect the grass, and it surrounds that resource although it is designed to keep the livestock in the surrounding pastures and away from the hayfield. Basic models In order to illustrate the main factors that promote fencing and influence the geometry of the fenced areas, we may start with an oversimplified situation and gradually work towards a more realistic one. I begin with a situation where the farming activites are neither constrained by neigbors nor landscape. Those living there have 3 problems. 2015 Journal of the North Atlantic No. 27 Á. Einarsson 14 They need a fixed location for shelter and storage of food, and a means to keep livestock within reach but away from the growing crop of winter fodder. One solution would be to build 2 concentric, circular fences around the house, the outer fence to keep the animals home, wide enough to provide good grazing throughout the summer, the inner to protect the hayfield. The shape is circular because that minimizes the length of fence. The circles are concentric because the center is the best location for management, and keeping the hayfield at close range minimizes travel. The outer fence should not be too large because of time constraints—the investment is not effective until the construction is finished and the circle has been closed. The next step is to add a neighor. He may establish an identical system, but more likely he will push his territory up against yours. One reason is the mutual benefit of cooperation (this is called the Allee effect after W.C. Allee, an early American ecologist), another is that there is pressure from other settlers and unclaimed spaces will be created if the circles are not pressed against each other. The 2 circles will meet, and a part of the boundary will turn into a straight line, a territory boundary. The fence built on this boundary will surely work as a marker of the territory but its primary function would be to keep your livestock home and your neighbor’s livestock away. With more neighbors moving in and pressing against your territory, its curved outline will turn into a polygon. The tendency should be towards hexagonal shapes. A fully settled plain of equally strong farmers should then be divided into near-hexagonal plots of land, fenced by walls to prevent movements of livestock across the property boundaries. Inside the hexagons, circular hayfields should be predominant. The farmer may want to subdivide his homerange further for other management purposes. Three factors may lead to different patterns: (1) A need for defense may lead to more clustered arrangements or fortification, (2) farmers are not equal, so territory sizes may differ, and (3) the landscape is not flat and homogeneous, leading to other types of geometry than circular or near-hexagonal. Much of the inhabited land in Iceland is either inside valleys or along shores, which means that the farms tend to be arranged in a single row. This linearity is generally carried over into the geometry of fields and fences, and instead of inherent nearhexagonal shapes, territories become square as a consequence of the tendency to minimize mutual boundary lengths (see Sveinbjarnardóttir et al. 2008 for an example). The landscape is usually not flat; most often it is tilted towards a valley bottom or seashore. This should lead to zonation with height. Nutrients are washed downslope and temperature is highest at the bottom, hence the highest fertility is expected at the lower end. Hayfields and craving animals (like cows) should be located there (e.g., Halldórsson 1780), with non-breeding animals at higher elevation. The resulting pattern for linear landscapes should be square territories and a zonation parallel to the river or shore. The landscape is clearly a predominant factor governing the shape of the territory, and thus the geometry of the outermost fences of a property. The subdivision of the territory is also determined by the landscape, with fences running either parallel with or perpendicular to the slope. There should also be zonation by distance from the dwelling place. The main factors influencing size and shape of fenced areas are summarized in Figure 9. Although the settling pattern we have discussed is best understood as a territorial system where farmers have spaced themselves out by pushing or avoiding each other, it does not exclude their interaction in other situations. There are obvious benefits of such interactions (exchange of goods, mating, mutual defense, helping) which then occur at other levels of the social network. Head walls and communal pasture The scale and configuration of the Viking Age walls suggests that their main function was to fence off adjoining farms. They also seem to have served herding and grazing management within each property. For example, the walls separated the Figure 9. A summary of the main factors affecting the size and shape of fenced areas. See text for discussion. Journal of the North Atlantic 15 2015 No. 27 Á. Einarsson farmland from the mostly uninhabited upland areas (Figs. 1, 10). A wall between adjacent farms is easily explained by the mutal benefit of keeping the livestocks separate. The head wall, bordering the upland, however, had a different purpose. One purpose was probably a “shoestring” function: just as an untied shoestring does not do its job, two boundary walls, one on each side, are of little use if they are not connected at the top (Fig. 10). There are other purposes too. The head wall constrains animal movement between the lowland and upland, allowing different management in each. Lawbook texts (Grágás, see Dennis et al. 2000:318, Karlsson et al. 1992:340), indicate that the upland was used for open-range grazing by non-breeding livestock, while the richer pastures close to the farms were mostly reserved for milking animals (see Guðmundsson 1981). The head wall would then have the dual role of keeping the milking livestock within reach in the rich pastures and keeping out the non-breeding, less-demanding animals, thus reducing competition. Whether the head walls were also property boundaries is not clear. In the medieval period, upland pastures could be either of multiple ownership (Icel. : afrétt, translated as communal pasture by Dennis et al. ) or a more remote common (Icel. : almenningur) with different rules for each (Grágás; Karlsson et al. 1992:330 and 369, respectively) (see Guðmundsson 1981). Elaborate rules determined the number of animals each landowner put into the communal pastures to guarantee that they were fully utilized yet not overexploited (Grágás; Dennis et al. 2000:132, 315–319; Karlsson et al. 1992:310, 335–342). It is not known if the afrétt was a mosaic of well-defined patches of ownership under joint open-range grazing management or if the ownership of the land was totally shared with no person claiming ownership of particular pieces. Both interpretations seem plausible. The afrétt as a whole was automatically fenced off by the combined head walls of adjacent farms, which formed a boundary between a fenced-in homerange of private use and the upland pastures used jointly by (mostly) local landowners for open-range grazing. It is interesting that the uplands were not divided by fences. Even if it might seem beneficial to keep one’s animals private and at a relatively close range, it would be impractical because the uplands were not defensible due to high fencing cost and the low marginal utility of the relatively poor upland reaches (Eggertsson 1992). The head walls were a relatively cheap way of enclosing the homerange of the farm, allowing the landowner to fence in his livestock and keep upland free-ranging animals from invading the more fertile pastures in a valley. For a landowner, it would seem to be an option to expand the homerange and move the head wall into the communal pasture, but the final position of the head wall was probably governed primarily by cost–benefit considerations. According to Grágás (Dennis et al. 2000:138, Karlsson et al. 1992:342), a legal duty was imposed on all owners of an afrétt to build half of the walls bordering on private land (Table 1). This rule should have stimulated a farmer to build his head wall on Figure 10. Forces shaping the farm enclosure. Property boundary walls have a fixed location, but the head wall should be flexible as it may not be at property boundaries. Its position (elevation) may be flexible within a zone of net benefit (benefit of expansion outweighing the cost of wall building and longer herding distances) but also dependent upon suitable terrain to build the wall. Distance between farms is approximately 1–1.5 km. See text for discussion. 2015 Journal of the North Atlantic No. 27 Á. Einarsson 16 the borderline of his private land, in order to avoid having to build it all by himself. Rich farmland close to home is defensible (and practical to fence), whereas the poorer and more remote uplands are not (Figs. 10, 11). In the uplands, instead of fencing, a strictly controlled open-range grazing system was organized and bound in legislation. The head walls were an essential part of this division. The private interests driving the territorial system of fences had a regionwide consequence for land management because it caused entire valleys to be fenced off from the uplands. The overall fence pattern will have sharpened and regionalized the division between fence-in and fence-out management, a major physical division of pasture land. When, for some reason, the walls went out of use, the whole countryside became an open range for grazing, only managed by shepherding. With the loss of fences, the original definition of afrétt became unclear, possibly leading to the age-long controversies over their historical significance and associated rights (Guðmundsson 1981). Rise and Fall of the Wall System A grazing system based on local and stable resources will tend to become fenced. The pressure to erect fences is related to the density of people and Figure 11. Hypothetical grazing management of a valley landscape in northern Iceland by A.D. 1000. Main walls in red, minor walls in black. Milking livestock at valley bottom, non-breeding livestock in upland part of enclosure, non-breeding sheep and possibly some cattle in communal pasture (Icel. afrétt), which was of multiple ownership. Zonation is parallel to the river. Hayfield enclosures close to farmhouse. Other small enclosures such as for meadows, arable plots, newborn animals, hay, and pigs not shown. Summer dairy production stations (shielings) not shown either, but according to the Grágás lawbook they were not allowed in communal pasture. Journal of the North Atlantic 17 2015 No. 27 Á. Einarsson their roaming animals and also on the size and shape of the surrounding landscape that the animals may escape to. The critical issue is whether the investment is affordable. This depends on the manpower available and their wages and on the availability and cost of suitable fencing material. The elaborate ancient legislation on fencing in Iceland suggests that it was seen by the ruling class as a good long-term investment and that the start capital was available. The rise of the fence system is not precisely dated because the turf walls may have been preceded by wooden fences while the woodland was still widespread (turf walls could hardly be built in forested land anyway). A long tradition of roundpole fences (Norwegian: skigård) prevails in Scandinavia, and such constructions would have been relatively easy in early Iceland. In the middle western prairie in North America, the first fences were mostly zig-zag rail fences that were easy to construct when wood was nearby. Some of these were later replaced by turf and ditch fences (turf embankments with ditches alongside; Hewes and Jung 1981). The fall of the wall system should be viewed in the cost–benefit context of territoriality. It is noteworthy that the wall system collapses at the time of other large-scale changes in the environment in the 12th–13th century, manifested in widespread abandonment of marginal settlements (e.g., Sveinbjarnardóttir 1992), thinning of the lowland farms (Lárusdóttir 2007), and a rapid increase in cottage farming and changed species proportions of livestock (Vésteinsson et al. 2002). A poorer economy may have prevented large-scale rebuilding of walls when needed. The walls may also have been judged by the ruling class as a failed experiment, not to be repeated after the walls were due for major repairs and rebuilding. Perhaps the demise of the walls reflects a depopulation, workers becoming too few and expensive. Maybe fenced-in grazing was becoming less feasible with fewer animals and radical changes in settlement or animal-husbandry patterns. These changes could be due to the abandonment of marginal settlements that allowed more upland grazing. Perhaps a fenced-in economy was based on a high proportion of cattle. The environmental degradation following the woodland clearance may also have been crucial (Dugmore et al. 2000, 2005; Lawson et al. 2007; Hallsdóttir and Caseldine 2005). All these wide-ranging changes in Iceland may have been a prelude to the late-medieval agrarian crisis on mainland Europe which has long been a key research problem for European historians and involved significant and lasting changes in the size of agrarian populations, farm prices, and the number of deserted farms during the period between 1300 and 1450 (Abel 1980). The many possible variables call for a modelling approach, perhaps involving regime-shift theory, which includes changes to ecological and economic systems that are difficult and impractical to reverse (Figueiredo and Pereira 2011, Scheffer 2008). In this paper, the discussion has been limited to the earliest and most basic territory and dispersion models. Models that go beyond the simple territorial division of space have also been developed. For example, in a model of a red grouse (Lagopus lagopus) population, the effect of territory sharing between neighboring relatives has been taken into account (Matthiopoulos et al. 2000). It may also be worth considering if some of the models concerned with helping and territory budding may be useful for studies on tenancy as a strategy to get access to territories in a saturated environment (see Bolender et al. 2008). Also, there is interesting work on the European badger (Meles meles) that examines the effect of den-site availability on group size, sociality, and territoriality, which clearly has a bearing on similar aspects in human societies (Woodroffe and Macdonald 1993). There is a growing literature that uses game theory to deal with questions about territoriality (see Adams 2001, Morrell and Kokko 2005). Game theory describes the flexible strategies adopted by individuals in response to the actions of others (Maynard Smith 1982). The landscape and competitive interactions of settlers are key factors in shaping the geometry of boundaries, and the colonization of Iceland or the territorial division of any other piece of land, including fencing, will not be understood without reference to such factors. The landscape determines the dispersion of resources, their density, seasonality, patchiness, and defensibility, which in turn dictate how they are most effectively utilized and managed (Roberts 1996). Long-term historical factors such as changes in the natural environment, population size, landholding strategies or marketing, and interactions of those, will mold and obscure the original settlement patterns (e.g., Roy et al. 2002). The walls of the Viking Age provide the oldest and the most comprehensible empirical evidence for an early settlement pattern and land division in Iceland. The significance of the walls has not yet been studied in detail, but the present paper may hopefully be a useful point of departure for such an analysis. Acknowledgments This paper is the result of a long-standing discussion on the significance of the Viking Age walls in Iceland. My thanks are due to the numerous researchers participating in 2015 Journal of the North Atlantic No. 27 Á. Einarsson 18 the wall research, most notably Orri Vésteinsson, Thomas McGovern, Sophia Perdikaris, Christian Keller, Oscar Aldred, Birna Lárusdóttir, Elín Hreiðarsdóttir, Stefán Ólafsson, and Oddgeir Isaksen. Literature Cited Abel, W. 1980. Agricultural Fluctuations in Europe: From the Thirteenth to the Twentieth Centuries. London, 1980. Originally published in German: Agrarkrisen und Agrarkonjunktur, Hamburg, Berlin, 1966. Adams, E.S. 2001. Approaches to the study of territory size and shape. Annual Review of Ecology and Systematics 32:277–303. Aldred, O. 2008. Unfamiliar landscapes: Infields, outfields, boundaries, and landscapes in Iceland. Pp. 299–321, In A.M. Chadwick (Ed.). Recent Approaches to the Archaeology of Land Allotment. BAR International Series 1875, Archaeopress, Oxford UK. Andes, R.H. 2000. Open-range law in the American West. Pp. 72–80, In G.M. Bakken (Ed.). Law in the Western United States. University of Oklahoma Press, Tulsa, OK, USA. Baker, M.J. 2003. An equilibrium conflict model of land tenure in hunter–gatherer societies. Journal of Political Economy 111:124–173. Barlow, G.W. 1974. Hexagonal territories. Animal Behaviour 22:876–878. Benedictow, O.J. 1993. The Medieval Demographic System of the Nordic Countries. Middelalderforlaget, Oslo, Norway. 229 pp. Benediktsson, J. (Ed.). 1968. Íslensk Fornrit I. Íslendingabók - Landnámabók. (Book of Icelanders and Book of Settlements). Hið íslenzka fornritafélag. Reykjavík, Iceland. Blank, T.H., and J.S. Ash. 1956. The concept of territory in the partridge, Perdix p. perdix. Ibis 98:379–389. Bolender, D. 2008. Dividing land and creating class: The development of a landlord-tenant political economy in medieval Iceland. Pp. 65–83, In E.P. Durrenberger (Ed.). The Anthropological Study of Class and Consciousness. University Press of Colorado, Boulder, CO, USA. Bolender, D.J., J.M. Steinberg, and E.P. Durrenberger. 2008. Unsettled landscapes: Settlement patterns and the development of social inequality in northern Iceland. Pp. 217–238, In L. Cliggett and C.A. Pool (Eds.). Economies and the Transformation of Landscape. Monographs in Economic Anthropology. Society for Economic Anthropology. Altamira Press, Lanham, MD, USA. Bradley, H. 1918. The Enclosures in England: An Economic Reconstruction. Columbia University, New York, NY, USA. Brown, J.L. 1964. The evolution of diversity in avian territorial systems. Wilson Bulletin 76:160–169. Brown, J.L. 1969. Territorial behavior and population regulation in birds. Wilson Bulletin 81:293–329. Brown, J.L. 1987. Helping and Communal Breeding in Birds: Ecology and Evolution. Princeton University Press, Princeton, NJ, USA. Cashdan, E. 1983. Territoriality among human foragers: Ecological models and an application to four bushman groups. Current Anthropology 24:47–66. Chabot-Hanowell, B., and E.A. Smith. 2013. Territorial and nonterritorial routes to power: Reconciling evolutionary ecological, social agency, and historicist approaches. In J.F. Osborne and P. VanValkenburgh (Eds.). Territoriality in Archaeology. Archaeological Papers of the American Anthropological Association 22:72–86. Cody, M.L., and C.B.J. Cody. 1972. Territory size, clutch size, and food in populations of wrens. Condor 74:473–477. Cowley, D.C., and J.G. Harrison. 2008. “Well sheltered and watered”. Menstrie Glen, a farming landscape near Stirling. Royal Commission on the Ancient and Historical Monuments of Scotland, Edinburgh, UK. 71 pp. Currie, D., D.B.A. Thompson, and T. Burke. 2000. Patterns of territory settlement and consequences for breeding success in the Northern wheatear, Oenanthe oenanthe. Ibis 142:389–398. Dennis, A., P. Foote, and R. Perkins. (Transl. and Eds.) 2000. Laws of Early Iceland, Grágás II. University of Manitoba Press, Winnipeg, MB, Canada. Dugmore, A.J., A.J. Newton, G. Larsen, and G.T. Cook. 2000. Tephrochronology, environmental change, and the Norse settlement of Iceland. Environmental Archaeology 5:21–34. Dugmore, A.J., M.J. Church, P.C. Buckland, K.J. Edwards, I.T. Lawson, T.H. McGovern, E. Panagiotakopulu, I.A. Simpson, P. Skidmore, and G. Sveinbjarnardóttir. 2005. The Norse landnám on the North Atlantic islands: An environmental impact assessment. Polar Record 4:21–37. Dyer, C. 2006. Conflict in the landscape: The enclosure movement in England, 1220–1349. Landscape History 28:21–33. Dyson-Hudson, R., and E.A. Smith. 1978. Human territoriality: An ecological reassessment. American Anthropologist 80:21–41. Eason, P.K., G.A. Cobbs, and K.G. Trinca. 1999. The use of landmarks to deﬁne territorial boundaries. Animal Behaviour 58:85–91. Eberhard, J.R., and P.W. Ewald. 1994. Food availability, intrusion pressure, and territory size: An experimental study of Anna’s hummingbirds (Calypte anna). Behavioral Ecology and Sociobiology 34:11–18. Eggertsson, Th. 1992. Analyzing institutional successes and failures: A millennium of common mountain pastures in Iceland. International Review of Law and Economics 12:423–437. Einarsson, Á. 1985. Use of space in relation to food in Icelandic Barrow´s goldeneyes (Bucephala islandica). Ph.D. Thesis. University of Aberdeen, Scotland. 244 pp. Einarsson, Á. 1990. Settlement into breeding habitats by Barrow´s goldeneyes, Bucephala islandica: Evidence for temporary oversaturation of preferred habitat. Ornis Scandinavica 21:7–16. Journal of the North Atlantic 19 2015 No. 27 Á. Einarsson Einarsson, Á., and O. Aldred. 2011. The archaeological landscape of northeast Iceland: A ghost of a Viking Age society. Pp. 243–258, In D.C. Cowley (Ed.). Remote Sensing for Archaeological Heritage Management. EAC (Europae Archaeologiae Consilium) Publications. EAC Occasional Paper 5. Einarsson, Á., O. Hansson, and O. Vésteinsson. 2002. An extensive system of medieval earthworks in northeast Iceland. Archaeologia Islandica 2:61–73. Field, J.S. 2005. Land tenure, competition, and ecology in Fijian prehistory. Antiquity 79:586–600. Figueiredo, J., and H.M. Pereira. 2011. Regime shifts in a socio-ecological model of farmland abandonment. Landscape Ecology 26:737–749. Fletcher, R.H. 1960. Free Grass to Fences: The Montana Cattle Range Story. University Publishers, New York, NY, USA. Fleming, A. 1988. The Dartmoor Reaves. Investigating Prehistoric Land Divisions. Windgather Press, Oxbow Books, Oxford, UK. Fretwell, S.D. 1972. Populations in a Seasonal Environment. Monographs in Population Biology 5. Princeton University Press, Princeton, NJ, USA. Fretwell, S.D., and M.L. Lucas. 1969. On territorial behaviour and other factors influencing habitat distribution in birds. I. Theoretical considerations. Acta Biotheoretica 19:16–36. Friðriksson, A., and O. Vésteinsson. 2003. Creating a past: A historiography of the settlement of Iceland. Pp. 139–161, In J. Barrett (Ed.). Contact, Continuity and Collapse: The Norse Colonization of the North Atlantic. Studies in the Early Middle Ages 5. Brepols, Turnhout, Belgium. Gard, W. 1947. The fence-cutters. Southwestern Historical Quarterly 51:1–15. Getty, T. 1981. Competitive collusion: The preemption of competition during the sequential establishment of territories. American Naturalist 118:426–431. Gill, F.B., and L.L. Wolf. 1975. Economics of feeding territoriality in the golden-winged sunbird. Ecology 56:333–345. Grigg, D.B. 1974. The Agricultural Systems of the World. An Evolutionary Approach. Cambridge University Press, Cambridge, UK. Guðmundsson, G.F. 1981. Eignarhald á afréttum og almenningum. Sögulegt yfirlit. Sagnfræðistofnun Háskóla Íslands. Reykjavík, Iceland. (Ownership of communal pastures and commons: An historical overview. In Icelandic). Halldórsson, B. 1780. Atli. Reprinted in 1948 by the Agricultural Society of Iceland, Reykjavík, Iceland. Hallsdóttir, M., and C.J. Caseldine. 2005. The Holocene vegetation history of Iceland, state-of-the-art and future research. Pp. 320–334, In C.J. Caseldine, A. Russel, J. Harðardóttir, and Ó. Knudsen (Eds.). Iceland: Modern Processes and Past Environments 5. Elsevier, Amsterdam, The Netherlands. Hasegawa, M., and M. Tanemura. 1976. On the pattern of space division by territories. Annals of the Institute of Statistical Mathematics 28, part B:509–519. Hayter, E.W. 1963. Livestock-fencing conflicts in rural America. Agricultural History 37:10–20. Helgason, A., S. Sigurðardóttir, J. Nicholson, B. Sykes, E.W. Hill, D.G. Bradley, V. Bosnes, J.R. Gulcher, R. Ward, and K. Stefánsson. 2000. Estimating Scandinavian and Gaelic ancestry in the male settlers of Iceland. American Journal of Human Genetics 67:697–717. Hewes, L., and C.L. Jung. 1981. Early fencing on the middle western prairie. Annals of the American Association of Geographers 71:177–201. Hixon, M.A. 1980. Food production and competitor density as the determinants of feeding territory size. American Naturalist 115:510–530. Hreidarsdóttir, E.Ó., and S. Ólafsson. 2012. Fornir garðar í Kelduhverfi. Árbók Thingeyinga 2011:66–83. (Ancient walls in Kelduhverfi. In Icelandic). Hugie, D.M., and T.C. Grand. 1998. Movement between patches, unequal competitors, and the ideal free distribution. Evolutionary Ecology 12:1–19. Ickes, R.A., and M.S. Ficken. 1970. An investigation of territorial behavior in the American redstart utilizing recorded song. Wilson Bulletin 82:167–176. Jordan, T.G. 1993. North American Cattle-Ranching Frontiers: Origins, Diffusion, and Differentiation. University of New Mexico Press, Albuquerque, NM, USA. Kain, R.J.P., J. Chapman, and R.R. Oliver. 2004. The Enclosure Maps of England and Wales, 1595–1918. Cambridge University Press, Cambridge, UK. Karlsson, G., K. Sveinsson, and M. Árnason. (Eds.) 1992. Grágás. Lagasafn íslenska þjóðveldisins. Mál og menning, Reykjavík, Iceland. 567 pp. (Grágás, the Law of the Icelandic Commonwealth, in Icelandic.) Kendeigh, S.C. 1941. Territorial and mating behavior of the house wren. Illinois Biological Monograph 18(3). University of Illinois Press, Urbana, IL, USA. Kennett, D.J., A. Anderson, and B. Winterhalder. 2006. The ideal free distribution, food production, and the colonization of Oceania. Pp. 265–288, In D.J. Kennett, B. Winterhalder (Eds.). Behavioral Ecology and the Transition to Agriculture, University of California Press, Berkeley, CA, USA. Kluijver, H.N., and L. Tinbergen. 1953. Territory and regulation of density in titmice. Archives Néerlandaises de Zoologie 10:265–287. Kodric-Brown, A., and J.H. Brown. 1978. Influence of economics, interspecific competition, and sexual dimorphism on territoriality of migrant rufous hummingbirds. Ecology 59:285–296. Kokko, H., R.A. Johnstone, and J. Wright. 2002. The evolution of parental and alloparental effort in cooperatively breeding groups: when should helpers pay to stay? Behavioural Ecology 13:291–300. Komdeur, J., and P. Edelaar. 2001. Male Seychelles warblers use territory budding to maximize lifetime fitness in a saturated environment. Behavioural Ecology 12:706–715. Krzewińska, M., G. Bjørnstad, P. Skoglund, P.I. Olason, J. Bill, A. Götherström, and E. Hagelberg. 2015. Mitochondrial DNA variation in the Viking age population of Norway. Philosophical Transactions of the Royal Society B 370: 20130384. Available online at http:// dx.doi.org/10.1098/rstb.2013.0384. 2015 Journal of the North Atlantic No. 27 Á. Einarsson 20 Lack, D. 1966. Population Studies of Birds. Oxford University Press, London, UK. 341 pp. Lárusdóttir, B. 2007. Settlement organization and farm abandonment: The curious landscape of Reykjahverfi, North-East Iceland. Pp. 45–63, In W. Davies, G. Halsall, and A. Reynolds (Eds.). People and Space in the Middle Ages, 300–1300 (Studies in the Early Middle Ages 15). Brepols, Turnhout, Belgium. Lawson, I.T., F.J. Gathorne-Hardy, M.J. Church, A.J. Newton, K.J. Edwards, A.J. Dugmore, and Á. Einarsson. 2007. Environmental impacts of the Norse settlement: Palaeoenvironmental data from Mývatnssveit, northern Iceland. Boreas 36:1–19. Lima, S.L. 1984. Territoriality in variable environments: A simple model. American Naturalist 124:641–655. Maher, C.R., and D.F. Lott. 2000. A review of ecological determinants of territoriality within vertebrate species. American Midland Naturalist 143:1–29. Matthiopoulos. J., R. Moss, and X. Lambin. 2000. The kin-facilitation hypothesis for red grouse population cycles: territory sharing between relatives. Ecological Modelling 127:53–63. Maurer, K. von 1852. Die Entstehung des isländischen Staats und seiner Verfassung. Buchhandlung von Cristian Kaiser, München, Germany. Maynard Smith, J. 1974. Models in Ecology. Cambridge University Press, Cambridge, UK. Maynard Smith, J. 1982. Evolution and the Theory of Games. Cambridge University Press, Cambridge, UK. McGovern, T.H., S. Perdikaris, Á. Einarsson, and J. Sidell. 2006. Coastal connections, local fishing, and sustainable egg harvesting: Patterns of Viking Age inland wild resource use in Mývatn district, Northern Iceland. Environmental Archaeology 11:187–205. McGovern, T.H., O. Vésteinsson, A. Fridriksson, M.J. Church, I.T. Lawson, I.A. Simpson, Á. Einarsson, A.J. Dugmore, G. Cook, S. Perdikaris, K.J. Edwards, A.M. Thomson, W.P. Adderley, A.J. Newton, G. Lucas, R. Edvardsson, O. Aldred, and E. Dunbar. 2007. Landscapes of settlement in northern Iceland: Historical ecology of human impact and climate fluctuation on the millennial scale. American Anthropologist 109:27–51. Morrell, L., and H. Kokko. 2005. Bridging the gap between mechanistic and adaptive explanations of territory formation. Behavioral Ecology and Sociobiology 57:381–390. Newton, I. 1998. Population Limitation in Birds. Academic Press, San Diego, CA, USA. Nicholson, A.J. 1958. Dynamics of insect populations. Annual Review of Entomology 3:107–136. Orians, G.H. 1969. On the evolution of mating systems in birds and mammals. The American Naturalist 103:589–603. Orians, G.H., and N.E. Pearson 1979. On the theory of central place foraging. Pp. 154–177, In D. Horn, R.D. Mitchell, and G.R. Stairs (Eds.). Analysis of Ecological Systems. State University Press, Columbus, OH, USA. Pálsson, H., and P. Edwards (Transl.). 2007. The Book of Settlements. Landnámabók. University of Manitoba Press, Winnipeg, MB, Canada. Rafnsson, S. 1974. Studier i Landnámabók. Kritiska bidrag til den isländska fristatstidens historia. Gleerup, Lund, Sweden. 256 pp. Reid, M.L., and P.J. Weatherhead. 1988. Topographical constraints on competition for territories. Oikos 51:115–117. Roberts, B.K. 1996. Landscapes of Settlement. Prehistory to the Present. Routledge, London, UK. 181 pp. Roy, L., G. Domon, and S. Paquette. 2002. Settlement pattern, environmental factors, and ethnic background on a southwestern Quebec frontier (1795–1842). Canadian Geographer 46:144–159. Scheffer, M. 2008. Critical Transitions in Nature and Society. Princeton University Press, Princeton, NJ, USA. Schoener, T.W. 1983. Simple models of optimal territory size: A reconciliation. American Naturalist 121:608–629. Simon, C.A. 1975. The influence of food abundance on territory size in the iguanid lizard Sceloporus jarrovi. Ecology 56:993–998. Smith, K. 1995. Landnam: The settlement of Iceland in archaeological and historical perspective. World Archaeology 26:319–347. Stamps, J.A. 1988. Conspecific attraction and aggregation in territorial species. American Naturalist 131:329–347. Stamps, J.A. 1994. Territorial behavior: Testing the assumptions. Advances in the Study of Behavior 23:173–232. Stamps, J.A., and V.V. Krishnan. 1990. The effect of settlement tactics on territory sizes. American Naturalist 135:527–546. Stamps, J.A., M. Buechner, and V.V. Krishnan. 1987. The effects of habitat geometry on territorial defense costs: Intruder pressure in bounded habitats. American Zoologist 27:307–325. Sutherland, W.J. 1996. From Individual Behaviour to Population Ecology. Oxford Series in Ecology and Evolution. Oxford University Press, Oxford, UK. Sveinbjarnardóttir, G. 1992. Farm Abandonment in Medieval and Post-Medieval Iceland: An Interdisciplinary Study. Oxbow (Monograph 17), Oxford, UK. Sveinbjarnardóttir, G., I.A. Simpson, and A. Thomson. 2008. Land in Landscapes circum landnám: An integrated study of settlements in Reykholtsdalur, Iceland. Journal of the North Atlantic 2008:1–15. Swanson, D.A. 2009. Fighting over fencing: Agricultural reform and antebellum efforts to close the Virginia open range.Virginia Magazine of History and Biography 117:103–139. Thorpe, H. 1951. The influence of inclosure on the form and pattern of rural settlement in Denmark. Transactions and Papers of the Institute of British Geographers 17:113–129. Tregenza, T., and D.J. Thompson. 1998. Unequal competitor ideal free distribution in fish? Evolutionary Ecology 12:655–666. VanValkenburgh, P., and J.F. Osborne. 2013. Home turf: Archaeology, territoriality, and politics. In J.F. Osborne and P. VanValkenburgh (Eds.). Territoriality in Archaeology. Archaeological Papers of the American Anthropological Association 22:3–27. Journal of the North Atlantic 21 2015 No. 27 Á. Einarsson Vésteinsson, O. 1998. Patterns of settlement in Iceland. A study in prehistory. Saga-Book of the Viking Society 25:1–29. Vésteinsson, O. 2006. Communities of dispersed settlements: Social organization at the ground level in tenth- to thirteenth-century Iceland. Pp. 87–113, In W. Davies, G. Halsall, and A. Reynolds (Eds.). People and Space in the Middle Ages, 300–1300. Brepols Publishers, Turnhout, Belgium. Vésteinsson, O., and T.H McGovern. 2012. The peopling of Iceland. Norwegian Archaeological Review 45:206–218. Vésteinsson, O., T.H. McGovern, and C. Keller. 2002. Enduring impacts: Social and environmental aspects of Viking Age settlement in Iceland and Greenland. Archaeologia Islandica 2:98–136. Vita-Finzi, C., and E.S. Higgs.1970. Prehistoric economy in the Mount Carmel area of Palestine: Site-catchment analysis. Proceedings of the Prehistoric Society 36:1–37. Votel, R., D.A.W. Barton, T. Gotou, T. Hatanaka, M. Fujita, and J. Moehlis. 2000. Equilibrium configurations for a territorial model. SIAM Journal on Applied Dynamical Systems 8:1234–1260. Winterhalder, B., D.J. Kennett, M.N. Grote, and J. Bartruff. 2010. Ideal free settlement of California’s Northern Channel Islands. Journal of Anthropological Archaeology 29:469–490. Woodroffe, R., and D.W. Macdonald. 1993. Badger sociality: Models of spatial grouping. Symposia of the Zoological Society of London 65:145–169. Zimmerman, J.L. 1971. The territory and its density dependent effect in Spiza americana. Auk 88:591–612.